KATHMANDU, July 9: Nepal Stock Exchange (Nepse) index shed 3.48 points this week to close at 1,715.72 points on Wednesday -- the last trading day of the week. The benchmark index took a dip this week after posting gains on a regular basis for the past few months, setting new records on the way. Analysts say that Nepse index fell marginally as investors keenly awaiting the monetary policy for Fiscal Year 2016/17. Since bank and financial institutions (BFIs) account for two-third of the listed companies, the policy taken by the central bank affects the stock market. "There was minor fall in the benchmark index this week as investors are selling their shares to book profit from rise in share prices in recent months. 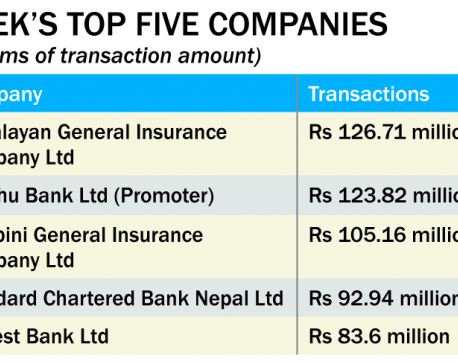 Many investors are selling their stocks to get funds for repaying their loans as fiscal year end draws closer," Raju Acharya, chairman of Asian Securities Pvt Ltd -- a stock brokerage firm - told Republica. As Nepal Rastra Bank (NRB) is preparing to unveil monetary policy for upcoming fiscal year, eyes of the investors are on the central bank's annual policy. “So far, investors are enjoying the cheaper fund due to low bank rates. They are keenly watching whether the central bank's policy will have direct or indirect impact on the stock market," Acharya added. Insurance sub-group plunged by the highest 191.73 points to close at 9,137.43 points this week. Hydropower group ended 20.03 points lower at 2,718.05 points. The sub-index of Development Bank group also fell 19.43 points to close the week at 1,794.71 points. Manufacturing and Processing group, however, logged gain of 44.56 points to close at 2,451.9 points. Finance group also went up by 45.34 points to settle at 851.42 points. Hotels and 'Others' sub-indices also gained 7.83 points and 4.7 points, respectively, to end the week at 2,036.49 points and 812.97 points. Banking, the heavyweight trading group in the secondary market, inched up 0.87 point to close at 1,554.04 points. A total of 9.96 million units of shares of 147 companies worth Rs 6.12 billion were traded in the stock market this week through 24,433 transactions. 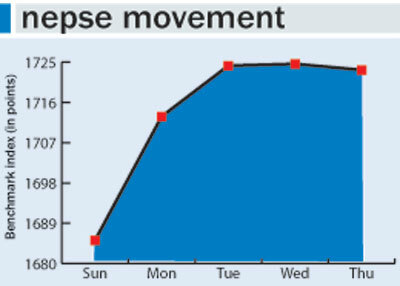 Meanwhile, Nepse is planning to extend trading hours. At present, the country's only securities exchange market is opened five days a week from 12 noon to 3 pm. Nepse has sought suggestions from the stakeholders on extension of trading hours. "Investors have been demanding that we extend trading hours. There has been increase in the access of market with the adoption of new technology and more investors are entering the secondary market,” a statement issued by Nepse on Sunday said.